It's about what I do: singing songs, writing lyrics, playing guitar, making guitars. These things I do for enjoyment, but there is a joy in reaching a level that people recognise as "professional". 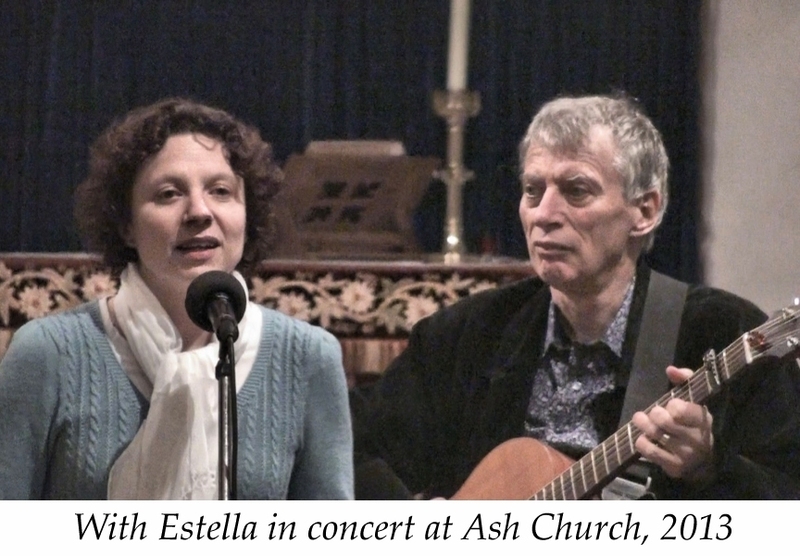 Home is New Ash Green in Kent and I have been performing in the local area, off and on, for many years. Now, through this website, the hope is to spread the enjoyment a little further. That's all you need to know really but this page gives a bit more history and background. On the "CDs" page you will find details of my songs and recordings with samples to listen to. The "Lyric Library" contains complete lyrics from a number of my songs. 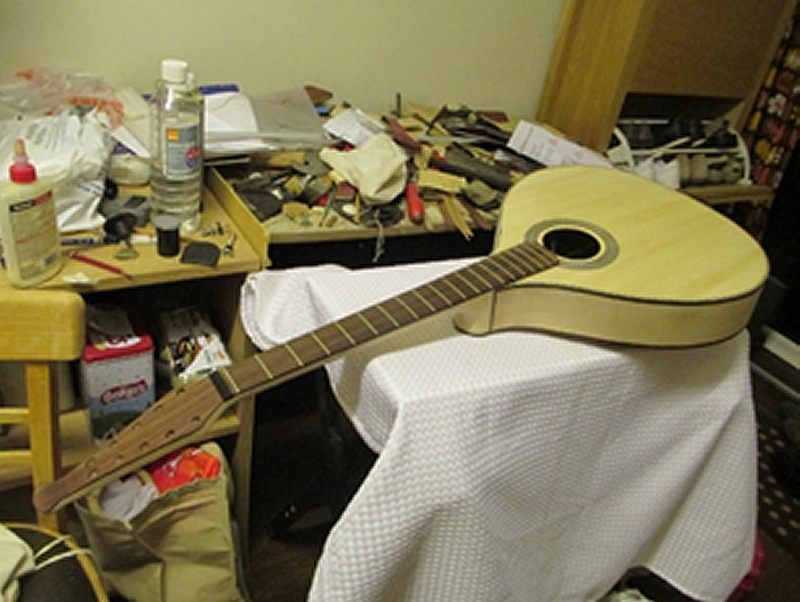 Under "My Instruments" there are pictures of things I have made, and a sequence showing the construction of a guitar in 2013. I have done commissions but don't make guitars for sale. If I paid myself the minimum wage I could not afford to buy one of my own guitars! ... but don't seem to have come very far. In fact it's - gulp! - 50 years since I started singing to audiences. Dad played the violin a bit at home, and was a fan of Stephane Grapelli. I think he was a bit disappointed that I didn't turn out to play like Django Reinhardt. Mum could play the piano and I learned a bit about chords from her. At school I dropped music to do languages. We weren't really a musical family and they were relieved when I settled to a proper job. But somehow music, any sort of music, just gets in your head and you have to do it. The next generation have proper jobs too, but our daughter Estella is a fine singer when she gets the chance, and son Sam plays guitar in a great Coventry funk/ soul band "Jakamo". I started doing floor-spots in London folk clubs in the 1960s, when I was a student. The folk revival seemed so new and inspirational then. Back in 1963 I had a deep desire for a 12-string guitar but all I could afford was a sheet of plywood, some strings and tuning machines, so the inevitable happened. That first guitar is still used occasionally. The oldest of my songs that I still sing dates from 1964. ... when you are a solo performer, but at least it means you don't have to worry about screwing up anyone else's performance. But I have also known the joy of making music with others. Like the short time I spent in 1966 with a German band called Dylan's folk. They were great lads and could get the sound but explaining to them in German what some of those lyrics meant was something else. Much later I was writing songs and sketches, and performing in a small group with our local drama group Act One. Along the way I learned to write and accompany songs for other singers - and non singers. This is why some of the songs were first written for a woman to sing. In 1998 we did the Keith Dewhurst play "Lark Rise" which my wife Jacky co-directed. I led the music, singing some of those lovely unaccompanied songs and playing traditional tunes with Ric on double bass, and two Brians - a fiddler and an accordion player. ... it's time to share my music with as many people as I can while I can still do it. I have a collection of 40 or 50 of my own songs with new ones coming along, as they do. I play in folk clubs within striking distance of home. We are also frequently in Warwick, and I sing a bit in the clubs there. Apart from the folk clubs I have appeared on the BBC Radio Kent programme "Kent Folk". I enjoy doing charity and fund-raising events - always happy to try and raise a smile for a good cause. 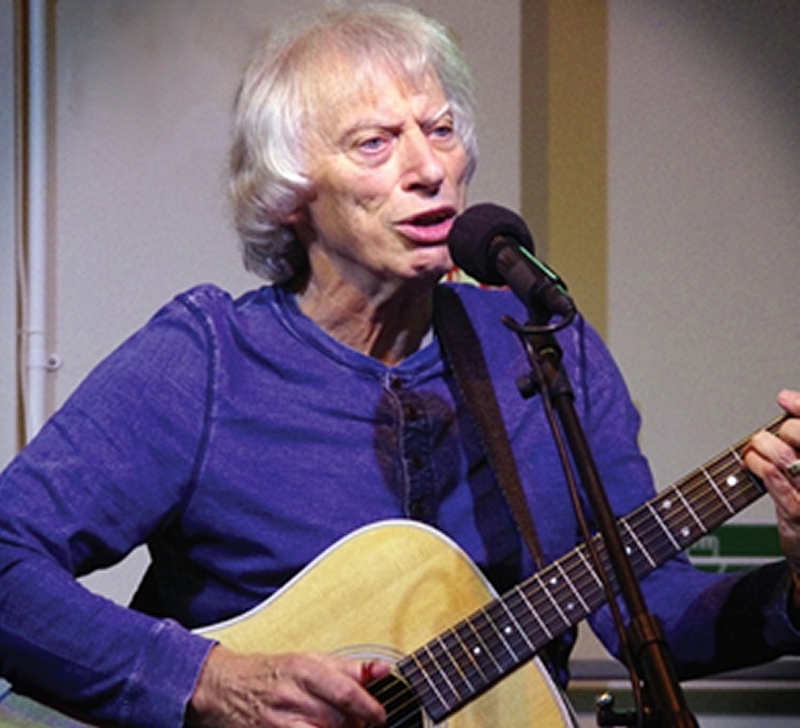 Playing in folk clubs doesn't make me a folk singer. The songs certainly include some elements of folk styles, and in some ways I aspire to be part of the folk tradition - recording our life and times in song. But most of what I do is not aimed especially at a folk audience. The great thing about the folk scene today is that there is such a rich variety of music, and formidably talented and accomplished writers and performers, young and old. I hope to be part of it for a while longer - see you there! For further Songs/Videos CLICK HERE to go to my Youtube channel including a regularly updated "Song of the month". I HOPE YOU ENJOY WHAT YOU FIND ON THIS WEBSITE. PLEASE SPREAD THE WORD TO ANYONE ELSE YOU THINK MAY LIKE IT. Tell me what you think - likes, dislikes, improvements we could make or things you would like to see on the site. Contact me to leave feedback, if you would like me to sing for you at an event or venue, to order CDs or for any other information.